This summer treat yourself and the family to some free fun at Ealing Broadway Shopping Centre. There will be a live bluegrass band, jugglers and a stunning Continental Market to browse around. 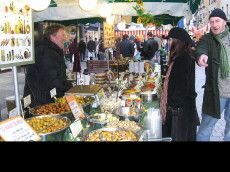 The fun starts with the Continental Market, which runs until Saturday 1 August. Based in the Town Square, visitors to the shopping centre can bask in the Mediterranean hospitality and enjoy food, ranging from olives from Spain, Belgian chocolates and Dutch toffee waffles. There will also be fashion stalls with leather handbags from Italy and cosmetic stalls with hand-made soap from the Provence. Sundays are for the kids as the Town Square comes alive with jugglers, face painters, balloon artists and a ventriloquist from 11am – 4pm. It all starts on Saturday 2 August with jugglers who will be getting into the summer mood by playing with beach balls, bathing suits, suntan cream and sandals. On Sunday 9 August there will be double the fun with a really creative gang of balloon artists and face painters. Kids can get their faces painted as their favourite animals, like a lion or a beautiful butterfly, or even superheroes! Anything is possible! The kids can then get their own piece of art with an amazing balloon sculpture – be it a monkey, a swan or even a flower. Anything is possible when it comes to balloon modelling. Last, but not the least, is the magnificent Colin the Ventriloquist who will be bringing his friends to life on Sunday 16 August. There will be veritable zoo in the Town Square, with a difference, as he’ll entertain the crowd with a bird, a monkey, a lion and even a dragon! On Saturday 8 August music fans will be treated to a bluegrass bonanza as The Rosinators take to the stage. With a raw, uncompromising mix of bluegrass, Cajun and Gospel Country, their distinctive a cappella harmonies and twenty-first century take on country blues have earned them legions of fans as they play roots music from the heart.